Can you list the names of your regular team mates and their positions? We have about 11 or 12 regulars, and most can fill more than one position. Fredrik drives, Missy Salvesen trims mainsail, and Cedric calls tactics and trims chute. Molly Wilmer trims jib and keeps track of numbers. Greg Larcher is on the bow, and Vernon Sheen does pit. Other crew that rotate in and out as needed include Chip Carr, John Meiser, and Fredrik and Missy’s daughters, Amanda and Lilla. Are there victories you’re particularly proud of? Last year we were trailing for High Point going in to the J/105 Chesapeake Championships. Everything was clicking for us, and we sailed an error-free regatta winning four of the five races and High Point by 0.0004 points. Another memorable victory was in the Lewmar Cup in the Mumm 30 class. We were in third place trailing by 17 points going in to the last day. The leaders “blew up,” and we went on to win the regatta in the last race. Can you name a few things you do to keep your crew working together? We never get down on ourselves. If we have a bad start, we set smaller goals, like “let’s pass two boats on this leg!” This keeps everybody engaged and working together. We are all friends and like to do things together on and off the water. How do you choose roles on the boat? Fredrik and I (Cedric) try to cross train the crews based on their abilities. This allows us to substitute as needed when some of the regulars cannot make it. What does your crew do exceptionally well? Our crew work is very strong, and that comes from practice and time in the boat. If we do make a mistake, nobody gets down because we know we have the ability to climb back in the race. Can you name a mistake you’ve made and learned from? Coming into the leeward mark on a tight reach while trying to drop an asymmetrical chute to leeward has its challenges. The lesson learned is to drop the halyard half way to unload the chute, and under no circumstances release the tack line. If you do, you are sure to shrimp the kite. What do you recommend to a skipper new to racing seeking advice on retaining crew? I think patience and loyalty are the two things that help retain crew. A lot of our core grew up sailing with or against each other at Severn Sailing Association or Annapolis Yacht Club as juniors. But other crew are homegrown talent. They asked to sail with us, and we took them out on a Wednesday Night Race (WNR). Eventually they “graduated” to weekend crew. For us the most important rule on our boat is show up when you say you are going to show up, and if you are willing to put in the time, we can teach you the rest. What do you recommend to crews who aim to do some charity regatta fundraising this season? The three charity sailing regattas—Leukemia Cup, CRAB Cup, and Hospice Cup—have all been brought together now with the introduction of the Triple Crown Trophy, which is awarded for a combination of fundraising and participation. The hope is that the overall trophy will increase fundraising and participation for all three events. Cedric sits on the Hospice Cup board of directors, so we focus on raising funds for Hospice Cup. 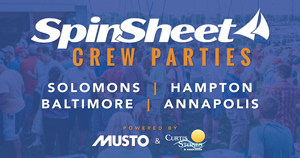 We also participate in the other two charity regattas by sailing in the events, buying tickets to the events, and donating to other boats trying to raise funds. They all use a website to manage the fundraising donations. For us, Cedric sets up “Team Mirage” on the Firstgiving site, and the rest of the crew create individual fundraising pages. Once your page is set up, send it to all of your friends and family. No donation amount is too small. Twenty $10 donations spend the same as one $200 donation. It helps to have a compelling personal story for why you support the charity. 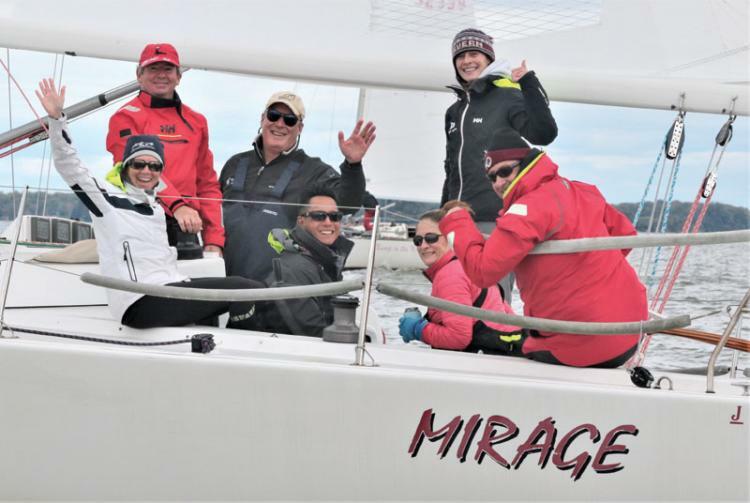 Team Mirage has been first or second in fundraising for Hospice Cup the last three years. Make sure every opportunity is a learning experience. If you have a new crew and they need to provide an important job, clearly explain it to them and maybe give time to practice a few maneuvers prior to starting to race that day.